Who Will Close in Atlanta? Though the retirement papers haven’t been filed, it seems that Billy Wagner has holstered his left arm for good and left an opening at the back end of the Atlanta bullpen. Since the closer position is such a volatile job – about one-third of the closers who begin the year earning saves end up losing their job to injury or poor play – cheap saves are tantamount to fantasy success. Guessing correctly about Atlanta’s pen will pay dividends. In the pole position is Craig Kimbrel, a fireballer with a 97 MPH fastball who has been groomed as the Closer of the Future with capital letters. He’s already fielding questions about being the closer this season. Eyeball ERA and strikeout rate alone, and he looks like a shoo-in. His numbers in those categories in both the minors (1.85 ERA, 14.4 K/9) and majors (0.44 ERA, 17.42 K/9) are impeccable, even eye-popping. Those two numbers don’t quite tell the whole story, though. There’s one more number that must come to the fore: Kimbrel has walked a ton of batters in his career – 5.7 per nine innings in the minors and 16 in his first 20 and 2/3 innings in the majors (6.97 BB/9). He’s got some Ricky Vaughn in him, too. Look at his pitching mix on Texas Leaguers, and you’ll see that this story continues on the pitch-by-pitch level. The swinging strike rates for his fastball (13.3%), changeup (24.3%) and slider (18.2%) are all well above the respective averages for those pitches (6.9% for fastballs, 15.1% for changeups, and 14.9% for sliders). It’s the changeup that gets strikes the least often (56.8%), and from FanGraphs’ splits page, we can see that he uses his fastball least often in 0-2 and 1-2 counts. Perhaps that poor strike rate on the pitch labeled as a changeup on Texas Leaguers leads to longer counts and more walks. Looking around the league to see if there’s a role model for Kimbrel, we see that only eight qualified pitchers had a walk rate over 5 BB/9 IP. Among those, only Carlos Marmol and Kimbrel’s teammate Peter Moylan had ERAs under 3.00. Marmol is the obvious comp for Kimbrel, though, since he was the only one who paired a double-digit strikeout rate with a very poor walk rate. If Marmol’s success is to be believed, it seems to say that a walk rate like that can work, if the strikeout rate is stratospheric. 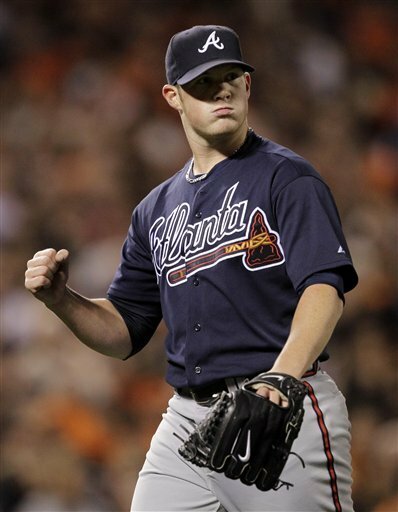 Still, there’s some risk with Kimbrel if there’s really only one comp out there for him. Competition from the rest of the pen should come mostly from fellow youngster Johnny Venters. The recently acquired Scott Linebrink is more decent than good (he’s never struck out a batter per inning or shown a good groundball rate, despite many solid years), and the rest of the pen is more about filling roles than finishing games. Venters fared well in his rookie year. He struck out 10.08 batters per nine innings and garnered 68.4% of his contact on the ground, both excellent numbers that deserve attention, especially since he cooks with gas (94.6 MPH). While his control isn’t great (4.23 BB/9), it’s not as poor as Kimbrel’s. There is still a caveat for the lefty – he’s much better against lefties than righties. He struck out 14.79 per nine innings against lefties (and walked 3.21 per nine), and only had a 7.69 K/9 (4.75 BB/9) against righties. Those split issues also followed him through the minors, so they might be real. Since Kimbrel has been groomed for the role and doesn’t own worrisome splits, he’s the front-runner. Venters is probably the backup plan. Treat them as such in your mixed-league drafts this season.